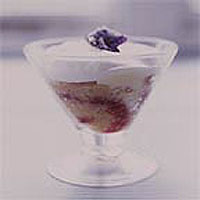 Trifle is a revelation, when made as it should be, with lots of quality sherry. Make the cake according the recipe and leave until cold. Sandwich the rounds of sponge together with the jam. Set aside. Make the custard. Whisk the eggs with the sugar and vanilla extract. Put the milk in a heavy-bottomed pan and heat until just below boiling, then pour slowly into the egg mix, whisking all the time. Return to the pan and stir over a gentle heat until the custard thickens enough to lightly coat the back of a wooden spoon. Don't let it boil or it will curdle. Leave to cool. Cut the sponge into 2cm chunks. Use half of these to line a 1.7 litre trifle bowl or 8-10 individual bowls, sprinkling generously with sherry as you go. Pour in half the custard and add the remaining sponge. Sprinkle with more sherry, then spread the rest of the custard over the top. Cover and leave for 5-6 hours, or overnight. Before serving, whip the cream and spread over the top. Decorate with cherries and angelica.